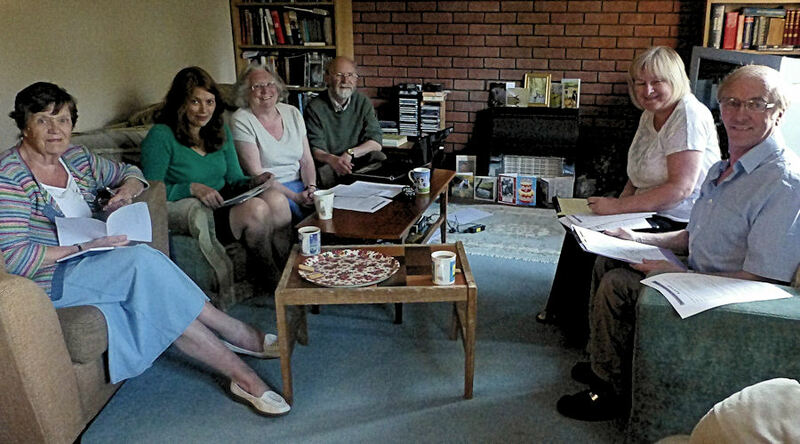 Photograph from a Swanbourne History Group Committee meeting. Members pictured (from left to right):- (1) Lyn Jones (2) Professor Penny Tuck (3) Frankie Fisher (4) Ken Harris (Chairman) (5) Linda Rodgers (Secretary & Treasurer) (6) Dr Clive Rodgers (Website Administrator). Members not pictured:- Betsey Fremantle and Vanda Bennett. 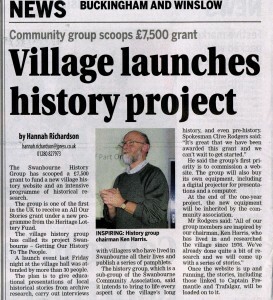 Bucks Advertiser – news extract from 30.11.12 edition pictures Ken Harris, Chairman of the Swanbourne History Group. Our mission is to “Get Our History to the People”, and for a small land locked village, you will discover what a truly amazing history we have! 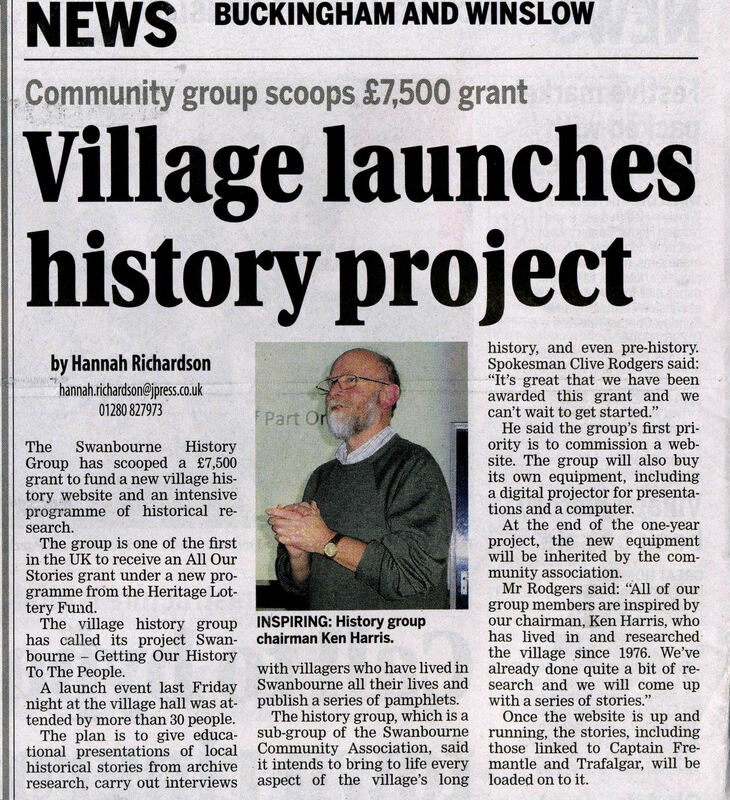 This project was originally made possible by funding from a Heritage Lottery Fund Grant in November, 2012, which also helped to fund a series of presentations and other events by the Swanbourne History Group within the village . Our members made frequent trips to Buckinghamshire Record Office in Aylesbury in order to meticulously transcribe local records which relating to Swanbourne, such as the Parish Records (going back to 1565), copies of Wills and old legal documents. In addition we were able to purchase relevant publications and subscribe to local history societies to widen our net of research. We also interviewed long- standing residents of Swanbourne in order to provide written recollections of stories from the past linked to the village and to help construct obituaries. During the first six months of 2013, much time was spent dealing with Hayley Clare Web Designs in order to closely influence the construction of our own unique Website. As the stories and genealogical data came in, month by month, material was added to the Website in preparation of our planned November, 2013 launch. 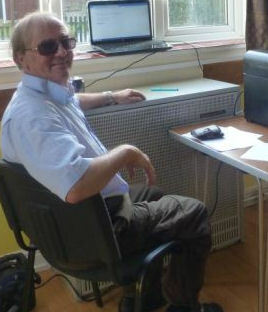 We purchased a good quality digital projector, computer and other equipment in order to enable the delivery of a series of bimonthly evening or afternoon events with PowerPoint presentations (delivered at the Village Hall in Swanbourne and published on the Website) by both members of the Swanbourne History Group and external speakers throughout 2013. Their tone was informative and educational, and they proved very popular. A History Trail booklet (including a map and historic photographs) was written, which provides a guided walk around the village explaining the significance of different buildings to the walker. Much time was spent digitally enhancing or re-photographing several hundred old photographs (which go back to early Victorian times) ready for incorporation within the Website and for publications. Most of these photographs were derived from local people or the Ken Reading Archive. The latter is a historical archive containing old photographs derived from deceased District Councillor and local farmer Mr Ken Reading. Out thanks go to his daughters for allowing us to use this material. This was launch day for the Website. As planned, it corresponded with the publication of the Swanbourne History Trail, and an evening event with a PowerPoint presentation. 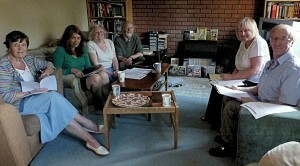 Hosting a genealogical “Who do You Think You Are” afternoon in the village. How to use the Website – Should you be interested in family history research, a Genealogical Message Board leads you directly to Swanbourne family data (e.g. Parish Records) which is on the top right of the Home Page. Four featured articles will be seen at the centre top of the Home Page, and the subject matter of these will rotate (from all of the menu articles available) every few weeks.There are 100 articles completed so far (7th November, 2013), so if you prefer to work your way through a single complete list, simply click on the ‘Articles’ title on the Home Page. Photographs featured on this Website should enlarge if you click on them. There are also a tremendous number of stories and banks of information available (usually in PDF form) which are downloadable within many of the articles. Our Website is now getting thousands of ‘hits’ from all over the world.We hope and believe you will find our articles informative and enjoyable, and if you are researching your family history, it may prove invaluable! Over the last 18 months, we have had 25,000 ‘hits’ from 104 different countries all over the world, and have hosted visits from Americans and Australians researching their family trees. The evening presentations and lectures continue, though with less intensity; e.g. Professor Ian Beckett of the University of Kent recently delivered a lecture on the soldiers from Swanbourne who served in World War 1. More events are planned through this year, e.g. and evening lecture and Powerpoint on the life of the Swanbourne fighter ace Anthony Bartley DFC will correspond with the 75th anniversary of the Battle of Britain this year. We look forward to continuing our work for many years to come, and adding further historical and genealogical stories as we research them. How can one small village have such an incredible variety of connections with some of the most important events in British and World history? Read on, and you will find out!